How do you choose a wine? You might walk in to the store looking for a red or a white, perhaps for a medium dry or a sweet wine with a fruity finish. A good wine is a complex experience and we’re blessed to have many producers of high quality kosher wines. But what do you do when you’re standing at the wine display and cannot recall which wines you enjoyed last week, or there don’t seem to be any more bottles of that wine? After all, part of the experience of wine is the ebb and flow of vintages as one season passes and the next season’s crop comes along. You could start reading the descriptions on the back of the bottle, but trying to compare a number of wines by these descriptions may not help much. You could choose your wines by brand and the varietal (such as cabernet, merlot, or chardonnay), but your favorite brand may offer a number of wines for each varietal they produce. What if there was a way to narrow down your choices without having to wade through the tasting notes? Even better, what if that information was just a few words, and not too hard to remember? That shortcut to choosing a wine is checking the appellation of origin. It’s well known that the same grapes, when grown in different regions, will produce very different wines. The features of the area, specifically the soil and climate, are often referred to as the terroir, and when a winery wants to tell you the geographic pedigree of its wine, it uses a tag on its label: the appellation. Some people focus on the countries or states where a wine was produced, but today, the quality of the wine is not defined by it being from France or Northern California. There’s a discernable difference in wines produced in regions that are only a few miles apart. This is because the features of a region have a significant impact on the growing of wine grapes. For example, rocky soil and warm temperatures are excellent for growing cabernets, while cooler microclimates and sandier soil provide great growing conditions for grapes like sauvignon blanc. Lake County has deep roots in wine making. The first vineyards were planted in the 1870s and by 1900 the region had produced a number of internationally recognized wines. As in many regions, Prohibition stopped wine grape production in the 1920s. It didn’t reemerge until the 1960s, when families who had grown crops like pears and walnuts began to plant vineyards. In 1965 there were less than 100 acres of vineyards, but today the acreage has grown to nearly 10,000 acres. Because of the outstanding quality of the grapes from the region, the acreage is expected to double in the next few years. The quality comes from the elevation, microclimates, soil types, and nearby Clear Lake, which is the largest inland body of water in the state of California. 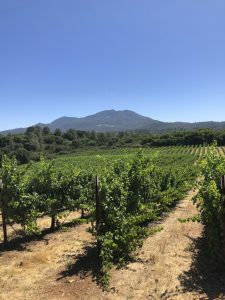 The Mayacamas Mountain Range, sometimes referred to as the “Axis of Cab” runs through Lake County, and Lake County vintners have moved beyond cabernet sauvignon and begun growing numerous other varietals like petite sirah, merlot, syrah, cabernet franc, zinfandel, chardonnay, and riesling. 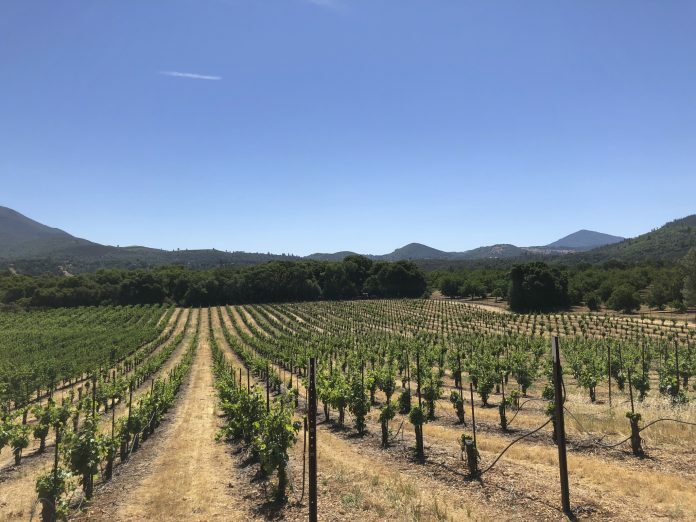 With the majority of the vineyards planted above 1,500 feet with some of the best air quality in the state, the higher and drier growing environment reduces the threat of mildew and pest pressure, resulting in lower pesticide use. Lake County is fast becoming a leader in high-altitude wine grape production and has hosted international symposia on the topic. Lake County wines have been winning awards and receiving critical acclaim. In 2017, Herzog Wine Cellars whose operations are based in Oxnard, California, purchased a vineyard in Lake County. Many great wines are expected to be released within the coming years from the grapes that are being grown there. There are already three excellent wines that truly showcase the capabilities of this region and which happen to be kosher, as well. We mentioned the rich history of cabernet grapes in Lake County, and the Herzog Special Reserve Lake County Cabernet Sauvignon 2014 was the first Herzog Cabernet Sauvignon harvested from the Lake County region. Herzog Wine Cellars are already up to the 2016 vintage now. It follows in the footsteps of the award-winning Herzog Reserves from Alexander and Napa Valley, opening with rich aromas of blackberry jam, cassis, and mocha with hints of sandalwood and vanilla. On the palate, concentrated favors of cherry and spice combine with velvety tannins and subtle notes of leather over a lasting finish. This is a wine that can comfortably age for the next eight to 10 years. But it’s not just the reds that flourish in this very special wine county. Herzog just released this summer its Lineage Sauvignon Blanc Musqué Clone. The musqué clone is a rare type of sauvignon blanc that has gained its prestige in the great white wines of Bordeaux. The appellation of Pessac-Léognan there is well-known for producing great, age-worthy white wines from the musqué clone, wines that are even more expensive than their red counterparts! The Herzog Lineage Sauvignon Blanc is wine that offers notes of lime, honeydew, and freshly cut grass with vibrant acidity and a refreshing finish. On the other end of the spectrum is the Hagafen Lake County Riesling. Riesling grapes are known for their high acidity and flowery aromas and tend to thrive in cooler wine growing regions. This varietal originated in Germany, and new-world plantings now rank in complexity with their old-world wine region ancestors. Because the riesling grape is known to express the terroir of where it’s grown, the region’s cool climate is perfect for the long-ripening necessary to produce the tropical bouquet and feel this wine displays. The Hagafen Lake County White Riesling is light yellow in color, but clear and clean. The aroma has tropical scents like pineapple, citrus, lime, and apple peel. The wine has a very new-world smell with good fruit aromas. The wine is light bodied with a fair amount of sweetness, but the sweetness is not overpowering, and it allows the acidity to come on soft in the mid-palate and stays soft the whole time through to the finish. The finish is light with more pineapple and citrus flavors. The next time you enjoy a great bottle of wine, you can note the Appellation of Origin and keep an eye out for the next year’s harvest. You may want to sample other wines from that region and enjoy the effects of the terroir on different vintages. And the next time you are faced with what may seem like too many choices of wine at a store display or online, you can look for wines produced in your favorite regions as you continue to develop your knowledge of the amazing and ever-changing world of wine. L’chaim! Ari Lockspeiser is a wine consultant for Kosherwine.com and Jwines.com.